The SL6640 performs the IF/AF function of a low power FM receiver. The circuit consists of a preamplifier, main limiting amplifier, quadrature detector, carrier squelch system, DC volume control and power audio output stage. With the SL6640C the demodulator and audio amplifier are muted by the squelch output. 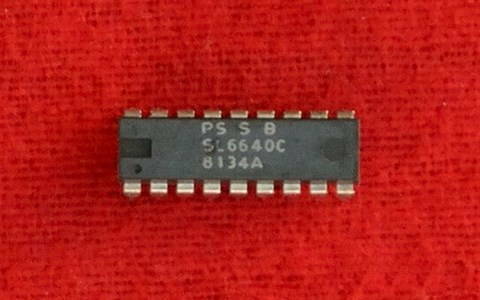 The SL6640C is intended for use at frequencies between 4.5MHz and 21.4MHz and will not operate at 455kHz. It should be preceded by a filter to determine the primary selectivity of the receiver. The input impedance is set by an external resistor connected to pin 16 as shown in figure 2. An interstage ceramic filter between the preamplifier and main amplifier provides some limitation of the noise bandwidth. The input impedance at pin 14 is again determined by choice of external resistance. The quadrature circuit is connected between pins 4 and 5. Normally this consists of a resonant LC circuit, and the high impedance level allows Q factors of over 100 if needed. A DC path should be provided between the pins if possible. The integral carrier squelch system is driven by detectors in the main amplifier and contains a comparator which requires an input to set the squelch level. A resistor between Pins 2 and 3 provides hysteresis; the value depends on the supply voltage, but a 360kΩ resistor gives 10dB hysteresis with a 6V supply. A squelch output (high when squelched) is available from pin 3 and is used to mute the detector, volume control and audio amplifier. The audio output stage is similar in design to the SL6310 and is arranged as an operational amplifier. The input signal is applied to the non-inverting input and gain is set to 20dB externally.